Gus Scheurer was a soaring pilot who, in his lifetime, was a witness and participant in the early development of motorless flight. In his native Germany in 1920, he and his friend Helmut Schneider formed a club to design, build and fly their own aircraft. Together they created the first glider trailer using steel rimmed wagon wheels. Previous transport had been by rail and ox cart. Gus earned his wings in 1923 and was granted Glider Pilot Certificate No. 55. He spent some time working with the well-known Wolf Hirth at the Rhoen, forming a lifetime friendship. He also was an early participant in the Wasserkuppe meets. He came to the United States in 1925 where he continued the building of gliders. Gus attracted others with this interest in New Jersey and the northeastern USA. He was the founder of the Aero Club Albatross in 1929, a long enduring and successful club in New Jersey. Gus served as President until the 1960s. This club is still very active and is, at this writing, flying out of Blairstown Airport. 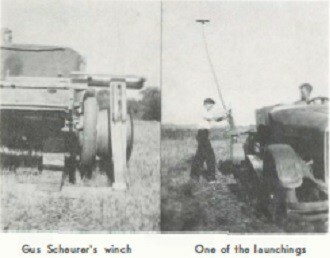 Using information from Germany, Gus designed and built the first glider launching winch to be used in the United States. It was constructed from Ford Model "T" parts and demonstrated at Elmira in the summer of 1933. The Aero Club Albatross hosted the New Jersey Competitions each summer in the early 1930s. These contests attracted as many as 10,000 spectators to their flying field at Liberty Corners in central New Jersey. Gus soon became an American citizen and was active in the organization of the Soaring Society of America. 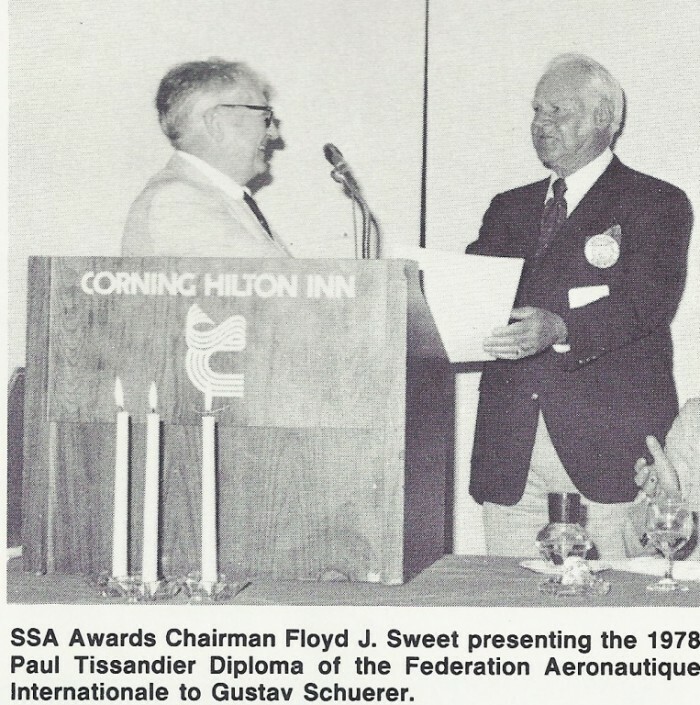 He received SSA Membership Certificate No. 28 signed by Warren Eaton, SSA's first President. This certificate was one of his proudest possessions. In addition to being a charter member of SSA, Gus served as a Director in 1937-38. When World War II arrived, Gus qualified as an instructor for the Army Air Corps but his employment in industry (Westinghouse) was essential so he could not be released to the Army. Gus built a Cherokee sailplane as well as restoring and maintaining the club aircraft. After his retirement, he devoted his time to the rebuilding of early gliders for the National Soaring Museum including the 1896 Chanute-Herring-Arnot hang glider and a Schweizer 1-19. Also included is the first glider built and flown by high school students in Elmira, one of whom was Floyd Sweet (also a member of the Hall of Fame) - a 1929 Dagling which Gus test flew. He remained active as a pilot into the 1970s. He would join the club as a "co-pilot" whenever possible. 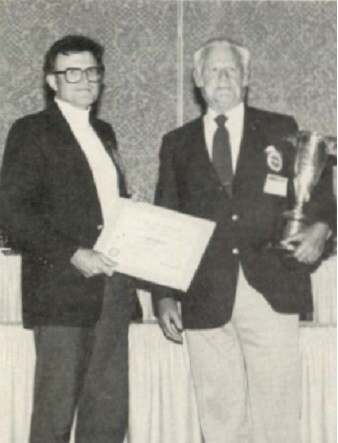 Gus Scheurer was awarded the FAI Tissandier Diploma in 1978 and the Eaton Trophy in 1982 when the SSA celebrated its 50th anniversary.